Virginia law states that you must always signal when changing directions. You need to increase communication on the expressway by signaling. Be sure to communicate lane changes, merges, exits and entrances. By signalling, you prepare those around you for your change in direction. Statistically, there are less crashes on the expressway than on urban and rural roads, but crashes are usually more serious due to high speeds. You should make every effort to increase expressway driving safety by communicating. IF THERE IS NO ONE BESIDE YOU AND SOMEONE BEHIND YOU IN THE LEFT LANE OF THE INTERSTATE, MOVE OVER! Yield to the left when merging or changing lanes. You must always look across all lanes, yielding to the driver to your left. The far left lane is the designated lane for the fastest traffic. By yielding in the direction of the left you reduce possible conflict with faster traffic. Also, the traffic flow is not changed by you driving slower. “The slow drivers that enter the expressway go immediately to the left lane, and if you try to pass them in the middle lane, they speed up.” Richmond, VA . This practice adds to congestion on the expressway and increases road rage. Additionally, a 143% increase in household vehicles causing a rise in the numbers of vehicles on the road at any given time in VA, is inciting road rage. Use the safe driving tip of moving over when someone is behind you and no one is beside you. This will make driving our expressways in Virginia a less stressful experience. 4. New law to fine slow left lane expressway drivers $100.00! The Virginia General Assembly passed a new law that goes into effect July 1, 2018. According to this new law expressway drivers will be fined $100.00 for driving below the speed limit in the left lane. Also, fines will be issued for driving in the left lane on the expressway and not passing. The General Assembly has designated this is a primary offense. This law will make our expressways safer by reducing the amount of aggressive drivers from weaving in the middle and right lanes when traveling on the expressway. Hopefully, also, congestion will be reduced by allowing the faster traffic to pass. Let’s all do our best to obey the laws and help reduce conflict on our roadways! 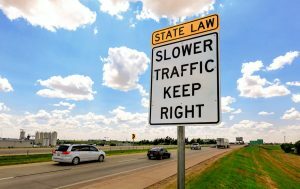 Follow the link to the article below to learn more about this left lane passing law that begins July 1, 2018. Sign up for a driver improvement course to learn more about safe expressway driving!